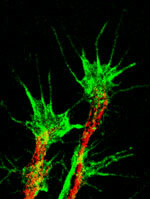 (1) Intracellular signaling during neurite outgrowth and sprouting. The aim of this research is to identify the intracellular signaling mechanisms important for neuronal outgrowth and to determine their effect on the cytoskeletal network. Recently we have shown that axon consolidation is an active process and that neurite sprouting is suppressed along the length of a neurite. We are currently examining the regulation of this signaling mechanism and identifying approaches to inhibit the signaling and stimulate neurite sprouting. In addition, we are also examining how the cytoskeleton changes in a neuron as it grows in its normal embryonic environment. Using a model insect system of neuronal growth, we analyze the location and activity of key regulators of cytoskeleton function in order to assess how neurons grow and turn in response to embryonic guidance cues. Using sophisticated imaging technologies we will provide some of the first observations of cytoskeletal dynamics of growing neurons in their embryonic environment. (2) Identification of small molecules that stimulate neurite outgrowth and regeneration. We have recently established a high throughput screen to identify novel compounds that will stimulate neuronal growth and regeneration on inhibitory substrates. Our goal for this project is to test these molecules in animal models as potential ther apeutics to stimulate neuronal regeneration and sprouting in the injured spinal cord. In the future we hope to similarly examine whether these molecules can provide therapeutic benefits to neurodegenerative disease models. (3) Examination of the role of semaphorins during embryonic development. 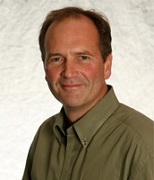 The aim of this project is to determine the function of semaphorins in the developing nervous system. Semaphorins are the largest class of guidance cue that is expressed in the developing nervous system and many of these molecules have been shown to repel or inhibit neurons as they grow. We are particularly interested in the biochemical regulation of semaphorin function and the receptors and second messenger systems that are stimulated by semaphorins. In addition, we are interested in examining the dynamic distribution of semaphorins, particularly with respect to the distribution of the functional regions of the semaphorin protein. Presently we are working on Semaphorins 1, 2 and 5. The O’Connor Lab is always looking for graduate students and postdoctoral fellows. Applicants are not required to have their own funding, but must be extremely motivated with a keen interest in developmental neurobiology. In order to preserve our funding for research, as opposed to salary, candidates are encouraged to eventually apply for external salary awards (i.e. studentships, fellowships) and thus must have a competitive CV (i.e. first class marks, appropriate experience/publications).Candidates should apply directly to Dr. O’Connor via email with an attached CV. Liu RQ, Wang W, Legg A, Abramyan J, O’Connor TP*. (2014) Semaphorin 5B is a repellent cue for sensory afferents projecting into the developing spinal cord. Development 141:1940-9. Browne K, Wang W, Liu RQ, Piva M, O’Connor TP*. (2012) Proteolytic processing of Semaphorin5B (Sema5B) produces a diffusible repulsive guidance molecule. Neurochem. 123:135-146. Lise MF, Srivastava DP, Arstikaitis P, Lett RL, Sheta R, Viswanathan V, Penzes P, O’Connor TP, El-Husseini A. (2009) Myosin-va-interacting protein, RILPL2, controls cell shape and neuronal morphogenesis via rac signaling. J Cell Sci 122(Pt 20):3810-21.International collaboration. O’Connor TP*, Cockburn K, Wang W, Tapia L, Currie E, Bamji SX*. (2009) Semaphorin 5B mediates synapse elimination in hippocampal neurons. Neural Dev 4(1):18. Mingorance-Le Meur A, Mohebiany AN, O’Connor TP*. 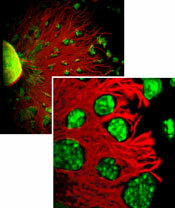 (2009) Varicones and growth cones: two neurite terminals in PC12 cells. PLoS One 4:e4334. Lett RLM, Wang W, O’Connor TP*. (2009) Semaphorin 5B is a novel inhibitory cue for corticofugal axons. Cerebral Cortex 19:1408-1421. Mingorance-Le Meur A, O’Connor TP*. 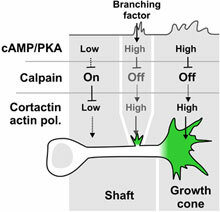 (2009) Neurite consolidation is an active process requiring constant repression of protrusive activity. EMBO J 28:248-260.